A few months ago, I started seeing these odd television commercials for a “shoe” from a company called Sanuk. After seeing the commercial a few times, curiosity finally drove me to their website. And a few minutes later, I decided to get a pair of them! The brand is best known for its Sidewalk Surfers, often referred to as “Not-A-Shoes”, for their patented sandal construction which allows your feet to bend and flex in natural comfort. 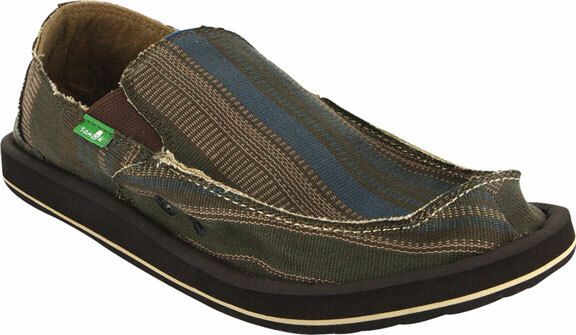 Imagine a lightweight canvas upper sewn onto a thong flip-flop bottom, and you get the idea. They call this approach Barefoot Un-Technology, which allows all the muscles in your feet to work as if they’re bare. A number of Hollywood A-listers have been spotted rocking Sanuks, including Matthew McConaughey, Brad Pitt, Zac Efron, and Julianne Hough! But that’s not why I got them, it was the design really sold me – Stylish yet casual! And the fit is just perfect, they were immediately comfortable without any break-in period. That’s a huge plus in my book, as I hate breaking in new shoes! Overall, I was really impressed with the Sidewalk Surfers. Everyone who sees them asks me about them, they really get noticed.. Find a dealer near you and check them out!